WORK SCHEDULE: Memorial Day – Labor Day; 40 hours per week with three, consecutive, mid-week days off; weekends, evenings, and holidays. Some overnight travel possible. APPLICATIONS ACCEPTED: Beginning April 21, 2014 until the position is filled. Assists with the administration, planning, training and implementation of visitor-focused programs. Programs and projects are related to interpretation, outdoor skills instruction, volunteer management, outdoor recreation, environmental education, partnership groups, and special events. • Daily support of and assistance with visitor experience programs and projects, including but not limited to: Let’s Go, interpretive programs, park volunteers, Jr. Ranger programs, and special events. • Working with a variety of OPRD office and field staff, and park volunteers to ensure consistency in operational procedures, projects, and products. • Creating, organizing, maintaining, and transporting program supplies and equipment. • Preparing marketing and program materials for a variety of audiences to support new and ongoing programs. • Educational background in parks, interpretation, environmental education, volunteer management, outdoor recreation or tourism preferred. • Experience working in one or more of the following program areas: interpretation, outdoor skills instruction, volunteer management, outdoor recreation, environmental education, partnerships, and special events. • Specialized skills in developing and safely leading outdoor programs with a wide variety of audiences. • Proficiency in Microsoft Office products required. • Ability to multitask on a variety of ongoing simultaneous projects. Independence, creativity and resourcefulness are key in this position. • Must be willing to communicate openly, ask questions, accept positive criticism, and work as a part of a dynamic team. • Applicant must also pass a criminal background check and possess a valid driver’s license and satisfactory driving record. Visitor Experience Program Assistants will receive a thorough employee orientation and written position expectations from lead workers. You may attend CORE training. OPRD Safety modules will provide job safety training. Project and task-specific on the job training provided to use tools and systems in place. Ongoing coaching and mentoring will be provided by supervisor and other team members. A final evaluation and exit interview will be provided at the end of the season. • Varied work environments depending on work location; must be willing and able to work in a busy, shared office environment and also out-of-doors, in uniform. • Computer with e-mail account and access to Internet, phone, audio-visual equipment and other tools provided. • Operation of a state vehicle expected – may include cars, trucks, vans, or golf carts, possible trailer towing. Submit a cover letter and detailed resume which describes your interest and relevant experience. Please be sure to state the dates that you are available. 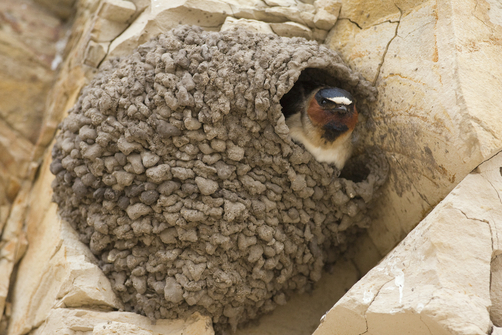 The Cliff Swallows (Hirundo pyrrhonota) are back and busy making a home for the young they plan to raise at Lake Billy Chinook. RANGE: Breeds from western and central Alaska and central Yukon to northern Ontario, southern Quebec and New Brunswick south to Mexico, southwestern Louisiana, northern portion of the Gulf States and southern North Carolina; also in the Lake Okeechobee region of southern Florida. Winters in South America. STATUS: Common in the West, locally fairly common in the East; overall populations are stable or increasing in the west. HABITAT: Originally restricted to the vicinity of cliffs and banks; now occurs over open country around farmlands, towns, bridges, dams, freeway overpasses, and other areas near mud supplies and potential nest sites. SPECIAL HABITAT REQUIREMENTS: A vertical substrate with an overhang for nest attachment, a supply of mud suitable for nest construction, fresh water with a smooth surface for drinking, and an open foraging area near the nest site. 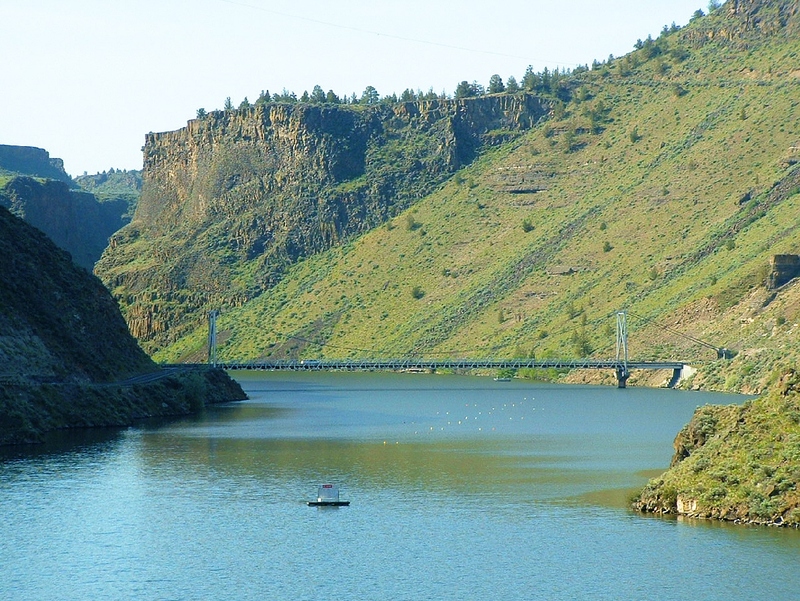 Strongest Oregon nesting habitat association on cliffs, bridges and buildings in urban and rural residential areas, and edges of cropland, pasture, and orchard. 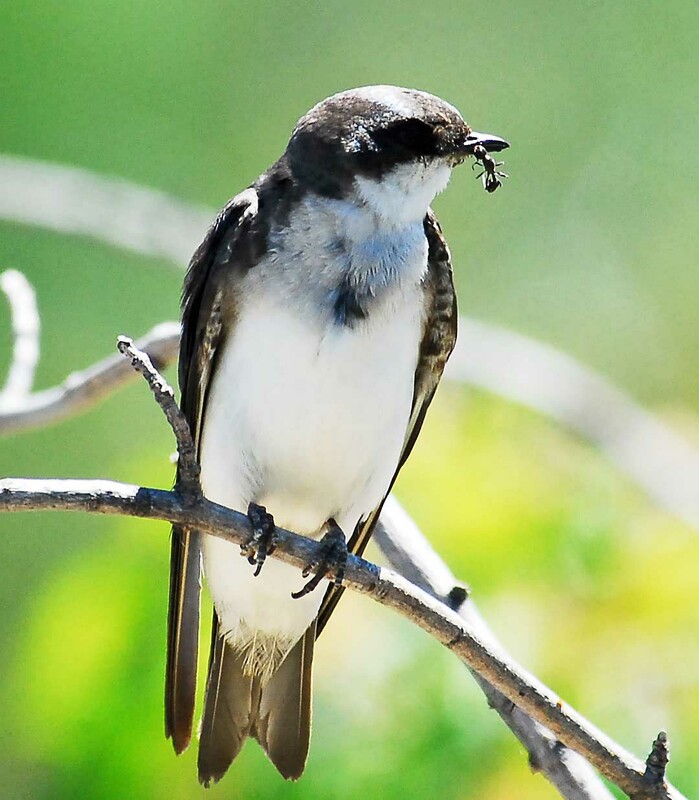 NEST: Originally nested on bluffs, cliffs, deep gorges in mountains, and sometimes on the side of large pine trees and in caves; has adapted to building its gourd-like mud nests under the eaves of, or in, buildings, under bridges, in culverts, on the face of dams, and under freeway overpasses. Forms colonies of up to several hundred nests in favorable locations. FOOD: Consumes insects caught while flying high, often above 100 feet, as nearly 100 percent of the diet. IN CENTRAL OREGON: Common spring and fall migrant throughout the region, except in southern Deschutes County the High Cascades. 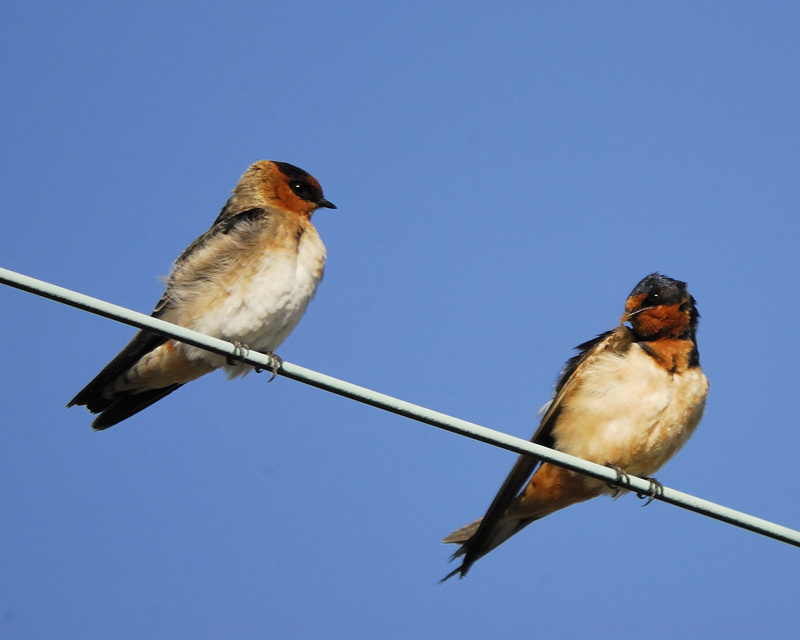 Traditionally arrives late April to mid-May, along with Barn Swallows, but departs much earlier, often by late August. Breeding usually confirmed between early May and late June. Easily found nesting on farm buildings or rimrock near open water and often in large colonies. In Central Oregon, we are just waiting for that first sign of spring which practically begs us to get outside and hit the trail again. As everything turns green, wildflowers peek their colorful faces up to the sun, and the swallows return, spring can be one of the most exciting times to explore our State Parks. Regardless of your outdoor experience level before hitting the trails, paddling the river or finding the perfect camp spot, it is always a good idea to check your gear and remember safety should be your first priority so that your adventure is a positive experience. Spring weather is in Central Oregon is unpredictable. The day may start clear and sunny and before you know it, snow is falling. Be sure to pack extra layers of clothing, including socks. In a word, spring hiking is wet. Snow is melting and rain is often falling. Be wary of wet surfaces and muddy roads. Speaking of wet, remember the old adage, “cotton kills.” While it’s great to have a cotton t-shirt or sweatshirt to slip on after the hike, wet cotton clothes rob the body of heat and take a long time to dry out. Be sure to wear synthetic clothes appropriate for the sport and conditions you’re experiencing. If you’re a paddler, don’t forget that if the air temperature and water temperature aren’t more than 100 when added together, hypothermia is a real concern if you get wet. Probably best to wait for a sunny day, or at the least, be sure to bring some dry clothes in your dry bag should you go for an accidental swim. Your joints, muscles and lungs may have been hibernating over the winter. Don’t start out on a 20 mile trail run if you haven’t been running in months. Be sure to warm up slowly and stretch when you’re done. This goes for hiking, paddling, biking, or any other sport. Work up to longer outings so you don’t injure yourself and miss the rest of the summer. Remember the last time you went camping? Last summer when it rained the morning you broke camp, the kids wanted to see the last Junior Ranger Program, your dog was running around the campsite and you discovered a hole in your air mattress? Well, if you’re like most of us, the tent likely reeks of mildew and the air mattress is still punctured. 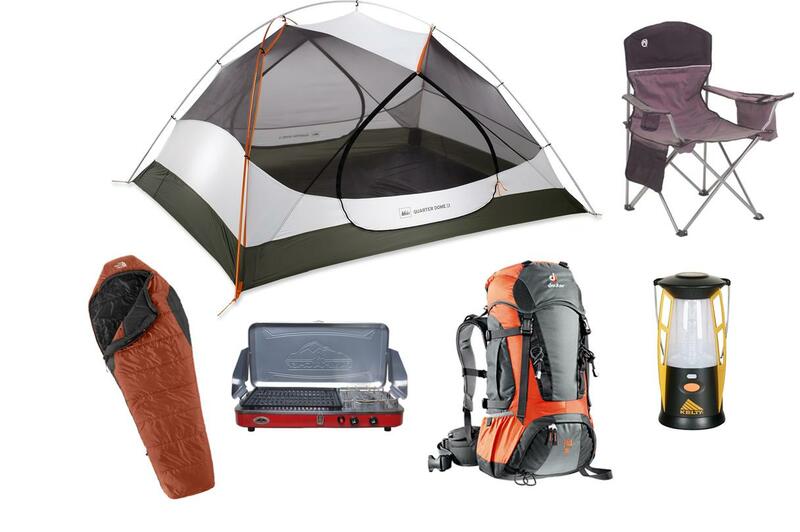 Pla n a weekend to check your outdoor gear. Be sure to clean and fix all of your gear before you go out. If you camp in a trailer or RV it’s time to de-winterize, stock up and fill up the propane tanks. Make a list so that you can restock if necessary – and don’t forget the S’mores! If you’re bringing kids or a newbie, this is especially important. Speaking of kids and newbies, start out easy… Maybe the three night backpack you’ve been dreaming of all winter isn’t the best early season trip. Start with something easier and adopt a positive attitude. Remember, you want this person to like camping, hiking, paddling, trail running, or whatever. 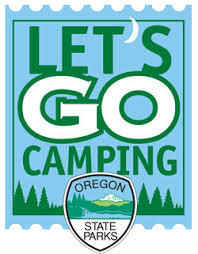 If you haven’t camped before and want to get some good advice, Let’s Go Camping at the Cove Palisades State Park is a great way to start. We provide everything you need and show you how to use it. This year’s program is scheduled for the last weekend in June. For more information contact Jill Nishball, Visitor Experience Coordinator, at 541-388-6073.